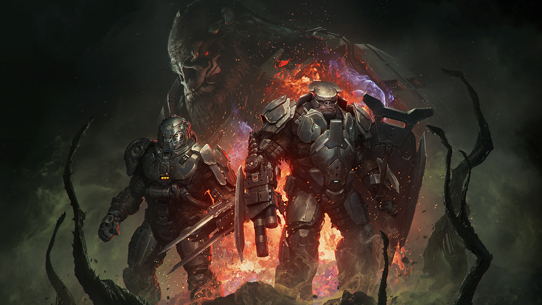 There are so many awesome things going on in the community for Halo Wars 2, from amazing gameplay videos and streams coming in from all over the place to fan art, story breakdowns, and much more. It not only enhances the community's experience and interaction with the game as a whole, but also inspires each of us internally at 343 as well. With that in mind, let's kick things off today with a huge thank you to everyone who loves and shares the same passion for Halo Wars 2 that we here at the studio have! 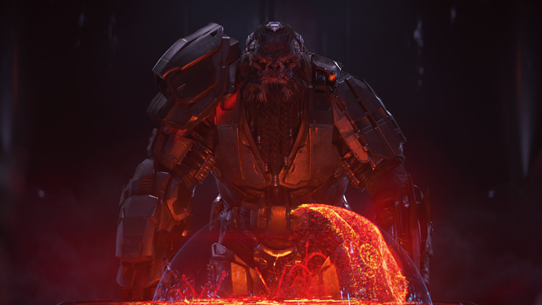 Today we wanted to showcase one particularly cool community-created effort: the Halo Wars Championship League. The HWCL is a fan-borne program started by Breaking the Clutch, Team Respawn, and The Banished (the community, not the easily-angered alien enemy faction). It consists of community Halo Wars 2 tournaments open to anyone who wants to play and currently running every weekend, culminating in a final invitational event on June 23. The prizing for this community effort will be awarded to the winner of that invitational and will include some special goodies provided by 343. We’ve had great interactions so far with the three community groups involved and the dedication and effort behind the scenes they are putting in to make a competitive community-driven tournament is amazing to watch! Sign-ups for each tournament happen weekly, and if you love competitive Halo Wars 2, keep reading to find out how you can join in on the action. Below is a list of tournaments being run by the 3 organizations, links to register for them, and what dates they will be happening. Registration Link will be provided by the teams as the invitational gets closer. This will be a tournament to determine the last 4 spots in the invitational tournament. Players who win this will be the 4 bottom seeded players for the invitational. Top 12 players and 4 players who qualified in the June 16th qualifier will battle it to see who is the best. Winner takes all including prizes from the organizations and something special from 343 Industries. We're super excited about the amazing efforts put forth by these communities members. It is so awesome seeing people who are so passionate with such love for the game that they are willing to put in the time to make these tournaments happen every weekend! To explore that passion a little bit deeper, we took some time to ask members of each team that are currently organizing these tournaments. 343: What made you really want to be so heavily involved in the Halo Wars 2 community? The Banished: I had previously seen how great a gaming community could be. I was heavily involved in a game called Evolve, and the community there was what I imagine the ideal would be. Newer players were welcomed and coached, people could discuss the game in a constructive and positive environment, and people had weekly tournaments to flock to and watch. After seeing that template, and the opportunity to implement a similar thing to a game and franchise I loved in Halo Wars 2 I just had to hop at the opportunity. Breaking The Clutch: After discovering how much the community cared about this game from hosting multiple tournaments alongside Breaking the Clutch, I realized that these tournaments were not for the money or fame, but for the social gathering and competitive spirit of these competitors. Team Respawn: I have always been a massive Halo Wars fan, going back to supporting the Ensemble Studios team before HW1 was even developed as my first game ever was Age of Empires. But the Halo Wars community has always been very close to one another. All the creators and frequent viewers all seem to know one another, and everyone has been so welcoming and caring about where Halo Wars is going as a series. While it may not be the biggest community, the Halo Wars community is definitely one of the best I have ever come across. Being involved with them is something I enjoy and talking about our experiences within the game. 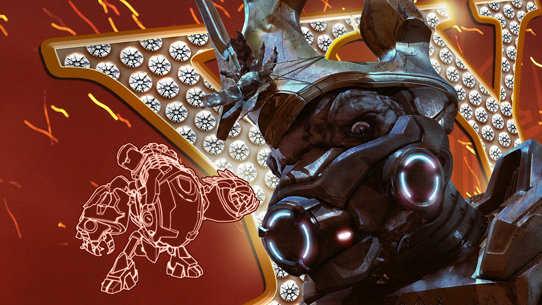 343: What brought you all together to do a joint effort tournament? B: Within my own organization it was because we all had an image of what we wanted high level tournaments to look like. As for HWCL I saw it as a dream come true. BtC and Team Respawn already had a really close relationship, and I loved the idea of joining our highly motivated community with their passionate communities. BtC: Uniformity and organization. All 3 organizations, Team Respawn, Breaking the Clutch, and The Banished aimed to create tournament leagues, so why couldn’t we just do it under one roof together? TR: I think it is good for the community to see a joint effort between all the content creators. It shows that we are all just friends having some fun playing Halo Wars. It also allows a viewer to discover more content to see, talk about, and participate in that they may have never seen before. 343: Where do you want to take tournament play within the community moving forward? B: Long term, I'd love to have invitational with dedicated casters and observers. Tournaments aren't only a great way to watch highly competitive Halo Wars but it can also be really educational, and casters are a huge part of educating the audience as to what the players are doing and why they are doing it. As a pipe dream I'd love live events to be hosted at a location where we can have competitors there live. BtC: As far as we can possibly go together! We want to make an area where casual and competitive players can meet up under one name to play against each other. TR: Tournament play is a great way to get players involved directly with their favorite creators. I would love to see the tournaments marketed to all other skill sets, not just the top tier players. TeamRespawn has proven that you don’t have to be the best at a game to enjoy it, and that seems true with most of our viewers. From our perspective, our viewers would love to see a more casual, laid back tournament using different balancing (ex: The Yappening), different game modes, and odd rules like a Random All tournament. 343: Out of the players within your organization who would you say is the best Halo Wars 2 player and why? B: I'd have to go with Viper Skills. Viper's won games against players like Metaloid, ASConviction, PatMac, and Yoda consistently. I guarantee if we had showcase matches between all three organizations I would count on Viper Skills as my wringer to go and win me any matchup I'd ask of him. TR: Probably me (Andrew). I’d like to say I am good at dropping leader powers in proper locations, having unit compositions, and counter attacks. 343: What has been your favorite matches to watch from all the tournaments that have been played in the past and why? B: It's a tossup, I loved watching PatMac's reverse sweep of RockGen, but I'd go for RockGeneration's series against ASConviction. His builds with UNSC are so unique and fun to watch, and only someone like RockGen could pull them off. BtC: Definitely the Breaking the Clutch summer championship 2v2 grand finals. Because this tournament had a lot on the line, plus it is when the game was closer to seeing with balance with all the newly released leaders! TR: Definitely when 2 top tier players face off. You can tell early on from their micro-management that it is going to be a shootout. This happened between ArmedMikey and LikelySquidward in our most recent tournament. It was a fantastic game to watch! 343: If you could make any one change to the game to help improve tournament play - what would it be? B: One of the most requested features from casters that I would also like is the ability to see more information. Such as what leader powers they've selected, the cooldowns on them all, and possibly the resource collection rate. BtC: I would personally change how fast the UI responds to actions. Thus, making it easier to micro specific units and to user their abilities, because in some cases, the player is faster than the game. TR: I think having a more centralized place to let players know who is hosting, when the tournament is being hosted, and where. So I think things like a calendar, links to each venue’s Challonge Page, Twitch Page, and Discord is a good way to organize things. 343: Sounds good, guys. Thanks for joining us, and we're excited to see how your tournaments go! Before we go, we also want to let fans know that the official Xbox Arena HW2 Tournaments will be starting up again next month and we are finalizing a schedule for those right now. Stay tuned for dates, but information can be found here and it will be updated as we get closer to the tournament dates. If you have feedback or questions about the 343 official tournaments, head over to waypoint and have your voice heard on the official feedback thread on the Halo Waypoint forums.